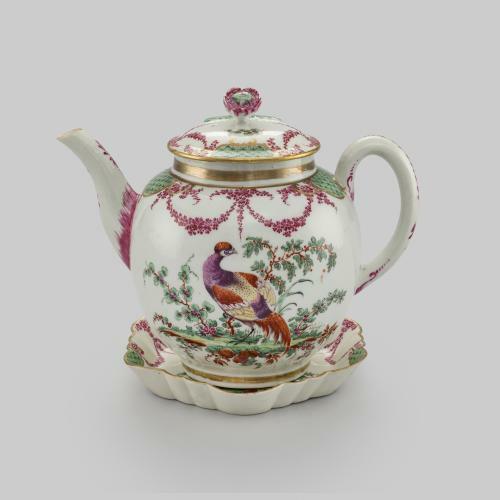 As tea-drinking became fashionable in Europe from the latter half of the 17th century, vast amounts of porcelain teawares were exported to the West from China and Japan. 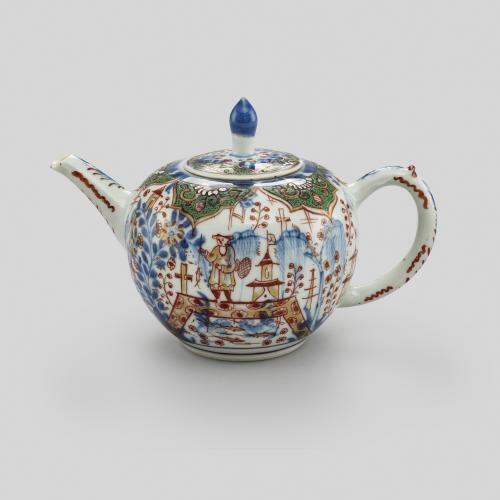 This teapot was probably made in the Jingdezhen kilns in China and is decorated in underglaze cobalt blue enamel with a scene of two cockerels fighting under a willow tree. Upon the teapot’s arrival in England, additional decoration was applied by English painters who used gold and coloured enamels to depict a man fishing from a pond with a church and graveyard in the background. European scenes were often added to make ceramics more appealing, a practice later known as ‘clobbering’. Over-decorating first appeared in Holland ca.1720 and continued in Britain well into the 19th century. 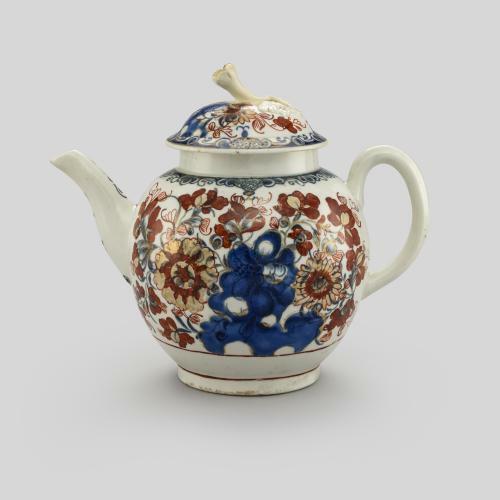 The distinctive, coloured scenes often clashed with the original Chinese design which led to the style’s derogatory name, as Victorian scholars regarded the garish over-decoration as a total disregard for the original Chinese blue-and-white designs. The bases of ‘clobbered ware’ often feature the British decorator’s red mark in the form of a square, filled with a pseudo-Chinese character.